Paul: I discovered something about dad's death.Sylvie: Really?Paul: Did you hear what I said?Sylvie: Yes, you discovered something, now, five years later. 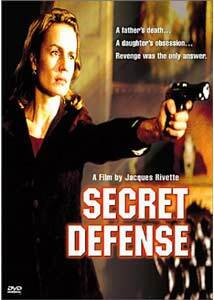 As I was watching Jacques Rivette's Secret Defense, I briefly pondered what would have happened if this had been filmed by Hollywood instead of by the master of long, slow pacing. No doubt it would have ended up as a lean 90-minute thriller, with far more dialogue and action, and certainly a more upbeat conclusion. I'm sure that will happen eventually, but for now we can enjoy Rivette's retelling of the tragic Greek myth of Elektra, who, if you need a refresher, is obsessed with avenging the death of her father.In Rivette's version, Elektra is Sylvie Rousseau (Sandrine Bonnaire), a thirty-something medical researcher living alone outside Paris. She is approached by her younger brother Paul (Gregoire Colin), who informs her that the accidental death of their father five years earlier was not an accident, but in fact murder. Paul has obtained a photograph, taken the day their father "fell" from a train, and it reveals a Mr. Walser (Jerzy Radziwilowicz), who was their father's "right hand man" at Pax Industries, in the background. Walser, who took over as head of the company after the accident, was supposedly out-of-town that day, and his presence in the photo is proof to Paul that Walser killed their father. Sylvie then begins to investigate on her own, and during the course of the nearly three-hour film, slowly begins to understand the truth about what happened to her father, and more importantly, why.Rivette stages all of his films with a deliberate, unnatural slowness, with an almost real-time feel to them, and Secret Defense is no different. This type of filmmaking is at first jarring with its snail-like pacing, but he makes this technique work very well as a narrative tool. The simple acts of making coffee, taking a train ride, catching an elevator or traveling by car, when in Rivette's hands, become lengthy, silent passages that add a subconscious level of realism that isn't often seen in domestic films, where quick cuts and rapid-fire editing are the order of the day. Sandrine Bonnaire, who somewhat resembles Mel Harris, gives a great performance as Sylvie. She has a very expressive face, and her frequent lapses into intense thought as she ponders the fate of her father are captured neatly by Rivette. Bonnaire's acting is very low-key, but extremely natural, and the strength of her portrayal of Sylvie is what really makes this film worthwhile.If you have seen any of Rivette's other works, you are well aware of his obsession with trains. As expected, there are trains everywhere in Secret Defense, and as with his Gang of Four, they figure prominently, as links that connect characters to one another. I don't know if there is deeper meaning to the presence of trains, or whether Rivette just likes the way they look. I suspect a deeper, underlying symbolism at work. Image Transfer Review: A very clean 1.85:1 widescreen transfer is offered by Image here. Colors are well-saturated, and natural, without appearing overly rich. Fleshtones are a little pale, though that may have been Rivette's intent. Image detail is quite good, with solid black levels.Some noticeable edge enhancement slightly mars an overall fine transfer from Image. Audio Transfer Review: The original French language audio track is presented here in 2-channel surround (with the obligatory English subtitles), though all of the dialogue occurs strictly across the front channels. Rivette uses no music in his film at all, except for the credit sequences, and as such his film focuses primarily on character dialogue. Extras Review: Nothing, other than 16 chapters and requisite English subtitles. Another leisurely-paced film from Rivette that is an extremely satisfying retelling of a Greek myth, despite its length. Bonnaire gives a terrifically underrated performance as Sylvie, and she alone is reason enough to seek this film out. Slow, steady and enjoyable. Recommended.